My little sister Tori was born a month before I turned 18, making me old enough to be her mother. She was born with beauty, grace, and a mischievous smile that made your heart go soft when you tried to be angry with her. She often made me feel young and old at the same time, and seldom could I keep from cracking up if she went to work on me trying to make me giggle. No matter how old we were, I could never stay mad when she was around. Just a few hours ago, we got 'the call'. You know, the one you never think you'll get. The one you pray will never come. The one that only comes out of the blue and hits you like a ton of rocks. Those type calls never make any sense...this one least of all. Tori is gone. All I can think is... how can that be? I always thought there would be time to get together and rid ourselves of past grudes. Now all there is is the past, and it is not what I would like it to be. Back in the 90's, when she and my sister Becky were well past 21, the two of them would show up at my apartment with bottles of beer. I wasn't much of a drinker then or now, but the two of them didn't mind if I drank coke while they had a beer. So we would be at the table laughing, with a bunch of empties on the table, and our mother and step-father would drive up. "Quick" Tori would say to Becky, and she and Becky would slide all the beer bottles in front of me! Louie and Mom would walk in the door, and there I'd sit with a bunch of empty Sam Adams piled up in front of me, while Tori and Becky appeared to be sharing a Coca-Cola. Mom never bought it for a minute, but somehow Tori thought Mom believed that I was quite the drinker, and Tori loved to tease and joke me about it over the years. It was often said of Tori... "She's no saint!" Heck, I said it many times myself. But she looked like an angel most of the time, and I think of it as some sort of impishness on her part that caused her to leave on St Patrick's Day. And I will forever picture her with that little mischievous smile. May God keep you safe now little sister. Your mother and the rest of us will do everything in this world to ensure your little girl knows how wonderful you are. While visiting Jaysa and Mike, I got a chance to see all sides of Mike. At times, he was as helpful as can be and ensured that pregnant Jaysa never had to lift a finger to get her laundry baskets up and down the stairs. Obviously, this is The Good Mike. Then there was The Bad Mike, the one who tried to get Jaysa riled up whenever he could (which is easy to do when you know how to push her buttons...or... when she's driving). Back in December, when I was there for the baby shower, Jaysa was driving and didn't realize her lights were off due to the bright whiteness of the snow. A police car with lights flashing pulled us over, took Jaysa's registration and license, then let her off with a warning ticket. After that, whenever Jaysa criticized Mike's driving, Mike would laugh at her and call out "raise your hand if you haven't been pulled over by a policeman this week!" To which, everyone in the car except Jaysa would raise their hand and touch the roof. To me, Bad Mike is almost as funny as Billy Bob Thornton's character in Bad Santa. Then there's The Ugly Mike. There are no words needed to point out that Mike would make a very ugly chick. Mike gave us a flash of girly style when he was rounding up wrapping paper and bows from a session of gift opening. Need a close up of this lovely look? Yeah, I heard that gasp from you! 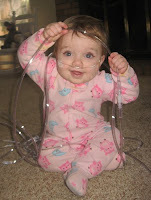 Last Friday we got a call from Jaimee about Lily being hospitalized for breathing problems due to a respiratory virus. Luckily "Gampy" Bill was supposed to be on travel this week, but it was cancelled last Thursday, so he went in to work on Saturday afternoon and was able to clear his schedule and take this week off. We jumped in the truck Sunday morning and drove all day, getting to Albuquerque on Sunday night just after Lily was discharged from the hospital and allowed to go home on oxygen. It was stormy weather on the way over, but towards the end of the trip a big rainbow lite up the sky toward the north. I got a feeling that all was going to be well with my world...Gampy was snoring from the back seat, a CD download of a broadcast from Coast To Coast AM was playing on the stereo, and I knew exactly where to find a little pot of gold! Here's Lily today, feeling much better and wondering how she can slip out of this oxygen tank contraption?